It's not greedy unionists or meddling governments that have caused a slump in iron ore prices -- the smoking gun is in the hands of Rio, BHP, Fortescue and Vale. The AFL has announced overnight that it wants to help its clubs wean themselves off poker machines, writes Charles Livingstone, of Monash University's School of Public Health and Preventive Medicine. After a three-year debate, Manningham City Council in Melbourne’s affluent eastern suburbs tonight will finally have a public vote on whether to introduce double rates on the municipality’s seven pokies venues. The AGM season formally finishes next Wednesday, November 30, and the final days will feature the traditional avalanche of penny dreadful gatherings, most of which will be missed by the media. 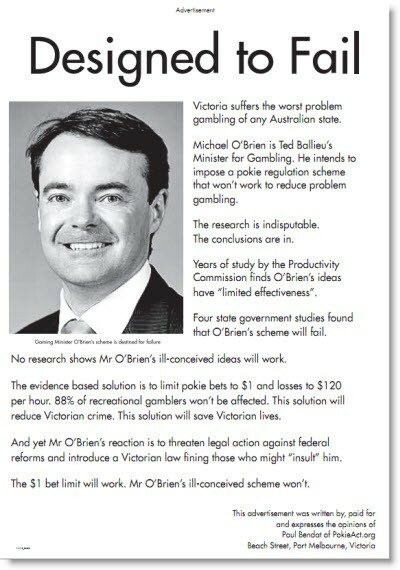 Despite the Baillieu government’s reluctance to tackle serious pokies reform, Victoria is central to the campaign for change and Paul Bendat’s full-page ad is a sign of what is to come for Victorian Liberals. Pressure is mounting on the blue-blood directors of Woolworths to decide whether they are pillars of the community or pariahs. Why are Victorian ratepayers paying Graham Richardson? After being paid millions by the Packer family empire since he quit federal Parliament in 1994, Labor Party fixer Graham Richardson has admitted his retainer came to an end about 12 months ago. If ever you wanted evidence that Woolworths is embarrassed about being Australia’s biggest pokies operator, look no further than the fact it is still yet to tell the ASX about spending more than $150 million buying new licences in Victoria. Woolworths CEO Roger Corbett may be regretting getting into bed with pokies billionaire Bruce Mathieson, after his comments on ABC radio have landed both men in hot water.